This post will hit those readers closer to my age (probably just me since I'm about the oldest person reading my blog:). I found myself remembering when I was a little girl. I was scared silly of getting a shot. Whenever my mom would drive anywhere close to the Dr's office, my world would slow down Once Mom would announce that we were going to see Dr. Joe, my world went white. Scared. to. death! Apparently, my brother was scared, too. He used to go around and lock all the car doors in the car after the family got out. I grew up in Birmingham, Alabama, but at this time we lived in Fairfield, a suburb of Birmingham. 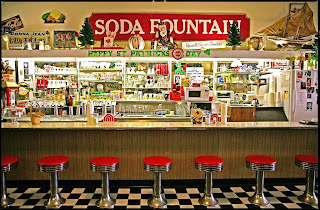 I remember the Rexall Drug Store had the neatest soda fountain. I remember the smell of the hamburgers frying on the grill and the taste of those just perfectly fried french fries...the fat, wavy kind that were crisp outside and soft inside. 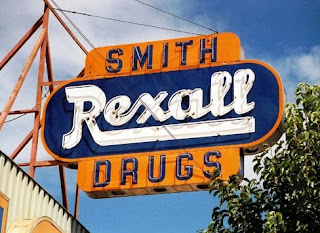 One time I had gotten a shot at Dr. Joe's office and was feeling especially sorry for myself, My mom let me pick out something at the Rexall Drug Store to allay my sore hiney. I pi cked out a Barbie. I loved her (the Barbie and my mom!) so much (and still do). She's the original Barbie with the black and white swimsuit and pony tail and she has red hair. With another shot, I got Midge, then later after an especially difficult inoculation, I got Ken. Skipper and the bubble hair Barbie followed. Was I spoiled. Yeah, I guess so, but the TLC was sure appreciated. I enjoyed spoiling our girls, too, when they had a tough visit at the doctor's office. There is something about wanting "to make it all better." The shot pain and dread is alive and well. We're already plotting the treats for Aidan's 5 year old shots. He doesn't know that we're going next week, but he was talking about how he doesn't like shots just this morning. Not fun for any of us.